Have you ever gone out to meet up with friends, got lost, and found your phone to have no battery when you needed to call them? Boo! Night-out ruined! Well, fear no more. With the advent of the mobile lifestyle, manufacturers today understand that this is every mobile gadget owner’s worst nightmare. As such, they have come up with solutions to address this. 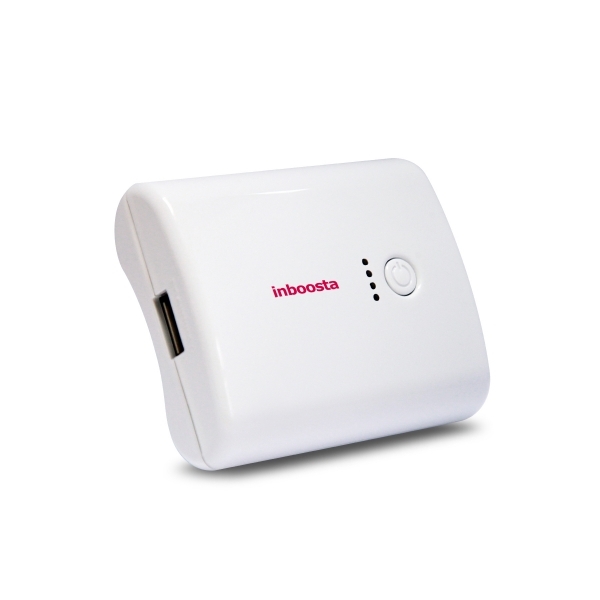 In comes the the Inboosta Travel Booster, a rechargeable battery charger for your multitude of gadgets. The Inboosta Travel Booster’s lithium-ion battery holds a capacity of 5200mAH. It's enough to get you through about 4 full cycle charges for a normal smartphone. It’s also pretty lightweight, weighing in at only 125g and is smaller, albeit thicker, than an iPhone. It comes with five separate adaptors, which provide charging options for micro-USB, Samsung, mini-USB, PSP and Nokia gadgets. If you’re an Apple user, however, you’ll have to use your own cable for this charger. I like how this was made with a simplistic design. The red logo and blue LED lights contrast well against the all-white body of the unit and makes it look classy without being flashy, as other mobile chargers over tend to do. Contrast to other portable chargers, the Inboosta Travel Booster has two output ports, allowing you to charge two units simultaneously, so you can have your phone charging at the same time as your tablet, provided that you have a second cable though. To try it out, I plugged my iPhone 4S into the recharging unit from 0% and it was able to charge the phone within an hour, as if I had it plugged into a wall socket. Right off the bat, what I didn’t appreciate was the fact that they didn’t include a wall socket adaptor for charging the unit. The manufacturer recommends plugging the charger into a USB socket or using your own adaptor. I understand it’s not mandatory, considering it’s safe to assume you have your own if you own any of the mobile devices the unit compatible with, but a price decrease would have at least justified the absence of a wall plug. It also takes a long time to charge – manufacturer specifications state that the Inboosta Travel Booster takes around 7-13 hours of charging itself, so you’ll definitely want to use this unit only in times when you REALLY have to charge your gadget and remember to charge the battery charger once you reach a wall socket. While the Travel Booster does not boast any extraordinary features or even the biggest capacity, it is indeed one of the smallest and lightest units available in the market. The design is nice but standard, and the long charge time is quite disconcerting, considering that the point of having a battery charger is to allow you to be mobile. Overall it wouldn’t be my first choice, but that doesn’t discount its usefulness. It certainly serves its purpose if you don’t want to shell out more money for one of the bigger capacity chargers available in the market. It will charge you up some, but will leave you wanting more. Inboosta Travel Booster comes in colors like white, purple, blue yellow, green, and pink. A 4400mAH model is also available.